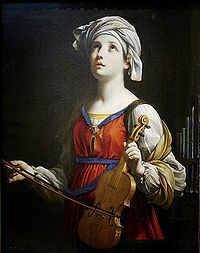 This is the feast day of the early Christian saint Cecilia. Musician and songwriter Paul Simon knew enough St. Cecilia lore to explicitly use her in her musical-patronage role in a different song, “The Coast” (lyrics). The song “Cecilia” deepens immensely if it’s understood as mixed frustration and exaltation with the minstrel’s inconstant artistic muse. Nor would that be the only 20th century musical homage for this accessible saint. In a more traditional vein, Benjamin Britten set to music a W.H. Auden poem about Cecilia, creating the Hymn to St. Cecilia. * So far as we know, blogging remains a niche of divine patronage as-yet unfilled. We propose to accept the protection of the patron saint of lost causes.